Every so often, a toy comes along that changes the whole industry. -G.I. Joe invented the action figure. -Star Wars created the 3 3/4″ scale. -Marvel Legends made 6″ the new industry standard. …And so on. One well-acknowledged watershed moment was when McFarlane Toys really raised the bar on sculpting, paint, and detail, producing works of genuine art as toys. If you look through their back catalogue, you can see the look evolve over time – but one figure in particular, one specific toy, really changed standards everywhere. When Mandarin Spawn came out, it raised the bar so high that the whole industry transformed. The Four Horsemen, a group of sculptors working for McFarlane who later started their own company, put such an immense amount of care and detail into this figure that it’s a work of art, even appreciated by people who don’t collect toys! 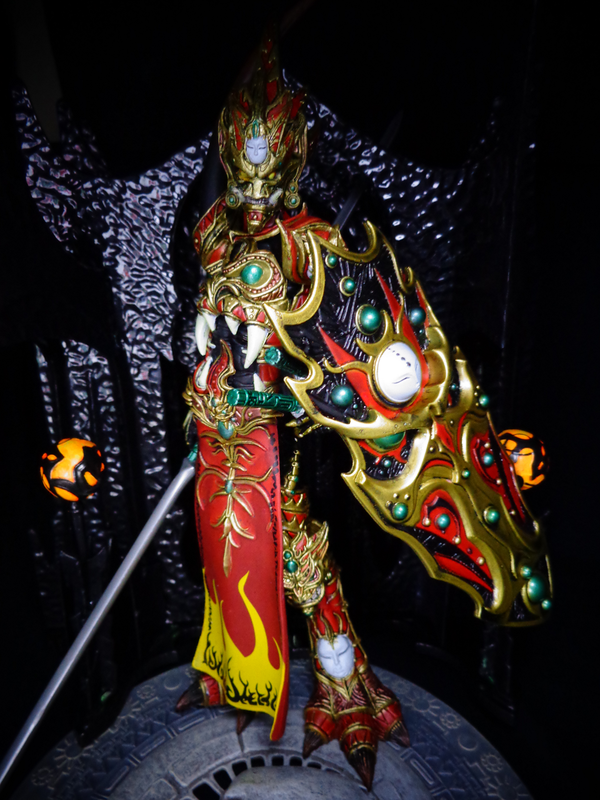 Mandarin Spawn: The Scarlet Edge came out in 1999 as part of the second Medieval Spawn collection. it soon became so popular that McFarlane Toys released five repaints, a 12″ version, and a complete redo of the character later on. And why not? It’s gorgeous! 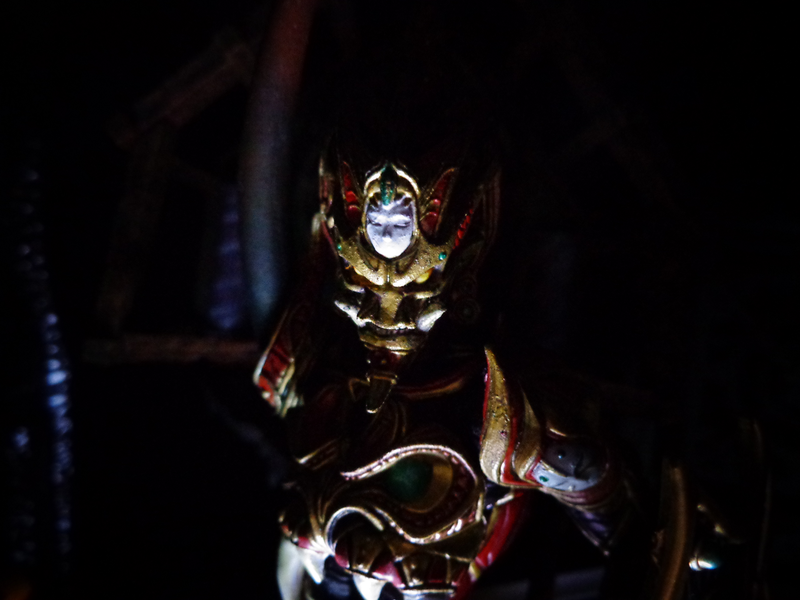 Although… come to think of it, Mandarin Spawn also marked the moment when McFarlane stopped articulating its figures and started producing little plastic statues. So bear that in mind. 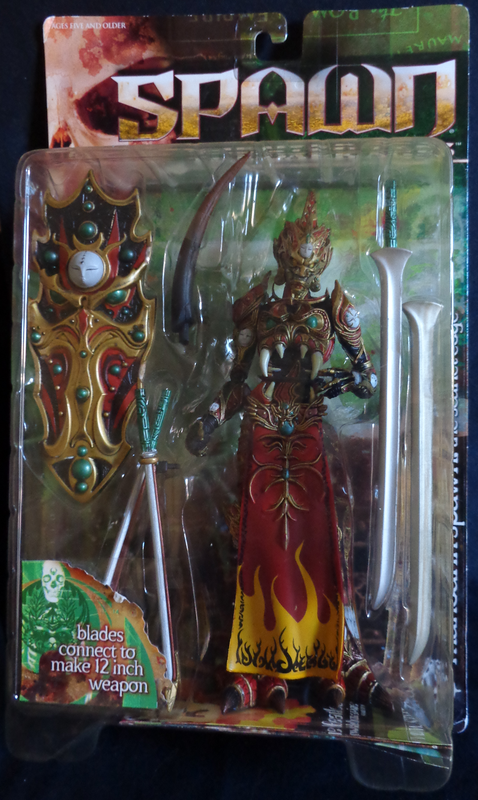 Although his toy has a bio, describing him as an alien warrior from another dimension (and later revised to “The Scarlet Edge was slain during the war against The Army of the Dead. Incensed by his own death, he has returned to earth to seek revenge. Now, masked in mystery, this warrior has taken a new name — Mandarin Spawn.”), Mandarin Spawn finally appeared in comics in 2007 (appearance based on the second action figure), as a man named Chenglei, who lived in ancient China. He was horribly deformed, and the local governor kept him as a slave, to torture, mock… and then accidentally kill. So Chenglei came back as Mandarin Spawn and slaughtered them all. You know, I kind of liked the other idea better. Sometimes I wonder if McFarlane’s toys are better than his comics. But anyway… let’s go look at the actual figure itself! This figure came out before McFarlane Toys started stuffing their figures in armored clamshells. It’s actually in an old-fashioned cardboard blister! It’s a nice, servicable little thing that shows off the figure, explains how his weapons connect, and has a bio and some cool photography on the back. It’s pretty basic, but this isn’t the kind of toy that you want to keep locked up in its plastic prison, anyway. Wow. 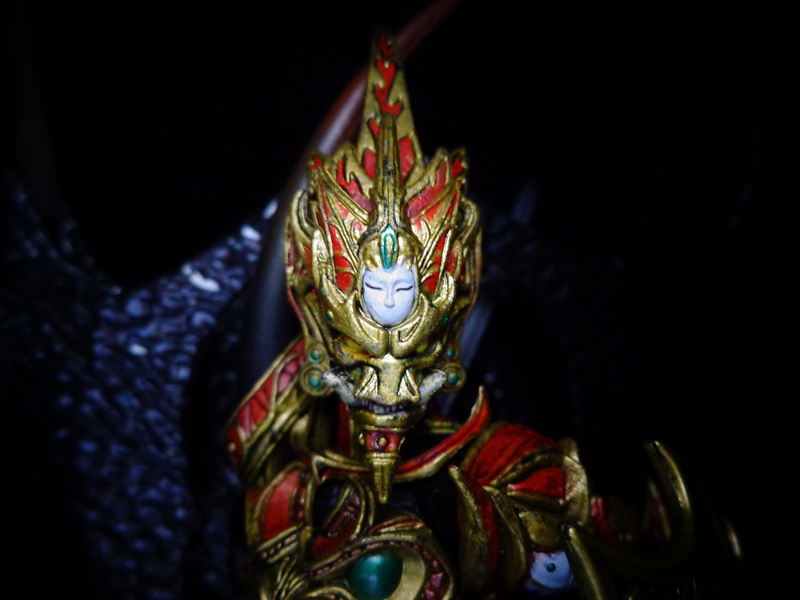 Even by today’s standards, Mandarin Spawn is incredible – the detail is insane! It’s almost too much – it feels like your eyes can’t take everything in! The Four Horsemen are known for their excellent sculpting abilities, and this figure is all you need to prove it. 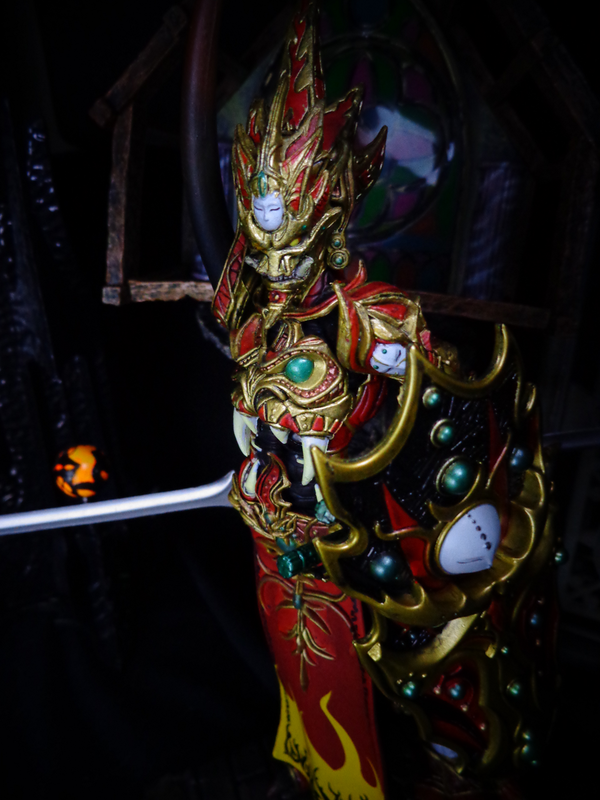 Mandarin Spawn is covered in immensely ornate armor, with detailing reminiscent of a dragon, or a lion, or a demon, or all of the above. It’s not very Mandarin Chinese, though. In fact, to be honest, I don’t think Todd Mcfarlane understands that Asia has more than one culture – Mandarin Spawn’s got pieces of Chinese and Japanese culture scattered all over his body! 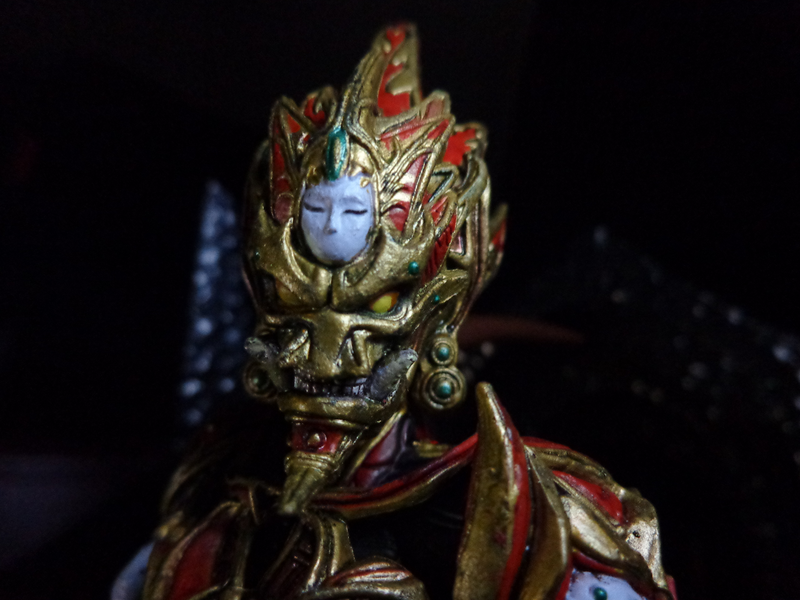 Whether it’s the Chinese body armor lion face, or the Japanese Noh masks strewn over his arms, legs, torso, and planted on his forehead, he is clearly designed to represent kind of an amalgamation of ancient Asia, not one culture in particular. Also, this figure is pretty vertical – he’s about nine inches tall, and very skinny. And he’s got a lot of faces. 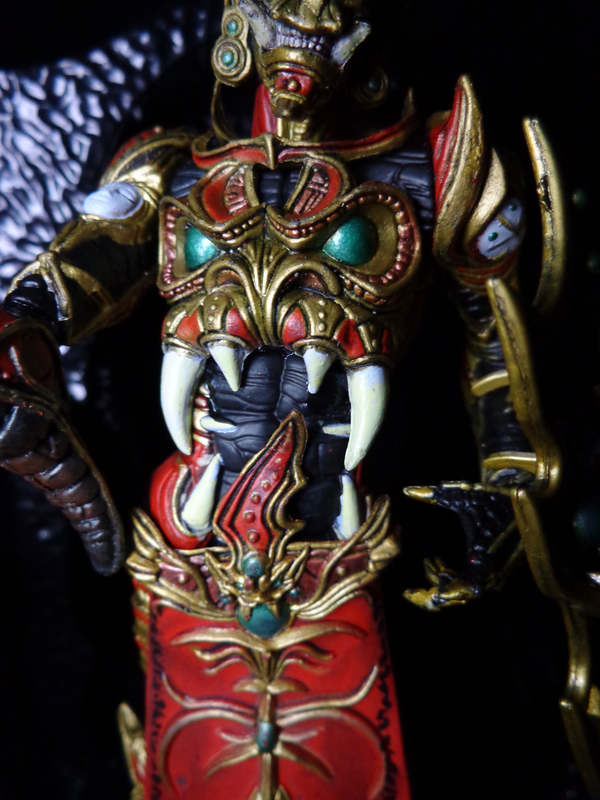 Mandarin has his actual face, the one on his torso, and tons of tiny masks covering every available surface! It gives him sort of an “All-Seeing” atmosphere, and actually adds to the character’s mystique as some sort of unknowable celestial or infernal warrior. 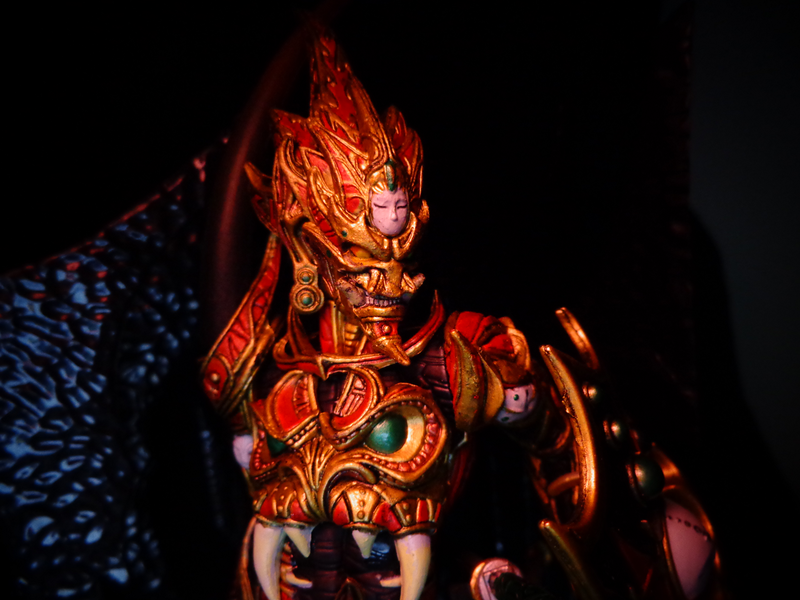 But it’s more than the faces, he’s got so many sculpted details everywhere that I really have trouble figuring out where to start. Should I mention the clawed feet? The massive spike on his right shoulder? The almost Guyver-esque crest on his helmet? 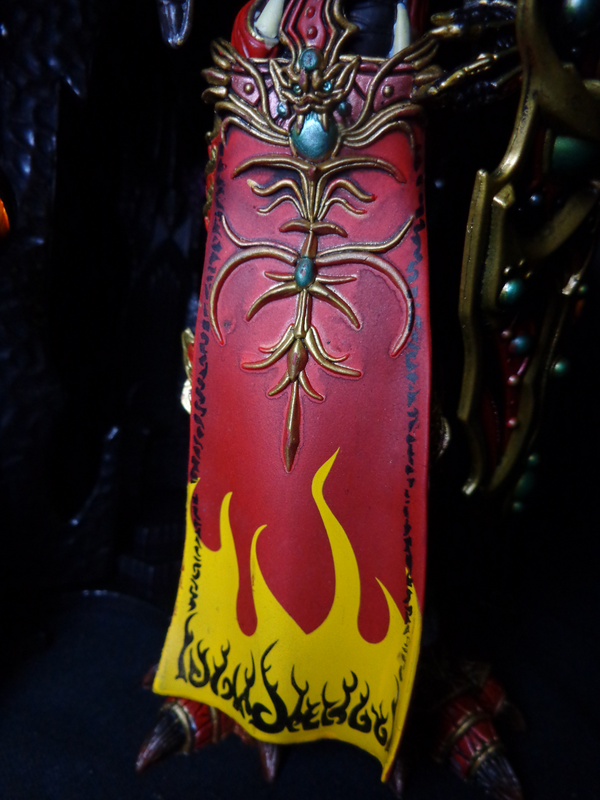 The beautiful filigree on his loincloth? The multiple layers of his gloves? I don’t know! Just trust me, this is a toy that deserves to be put on display. They have repainted this figure many times (and I used to own the one that was bone-white, jade-green, and brown), but the first go still seems like the best. 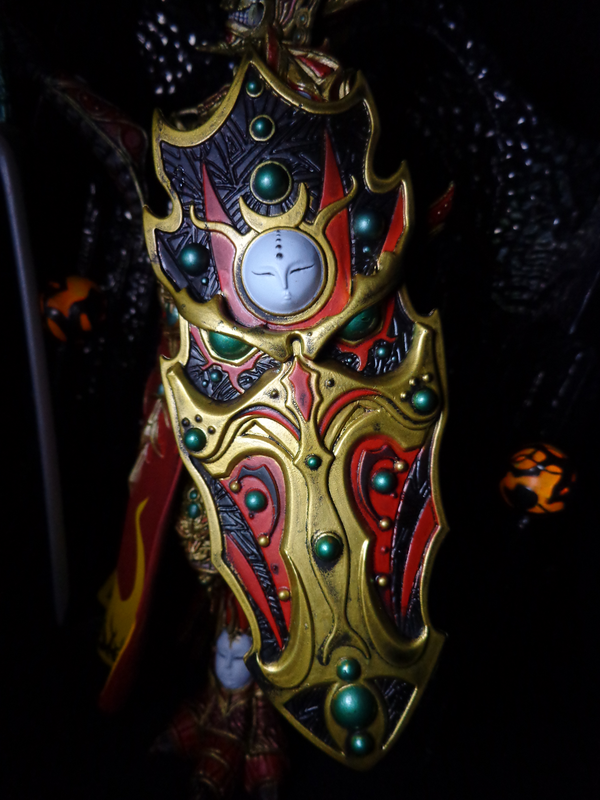 Mandarin Spawn is fiery and regal, painted in shades of gold and gray, offset with splashes of bone white, black for the undersuit, or jade green for some of the ornamentation. For the most part, the detailing is immensely precise, enough to easily hold up even in today’s market. But that said, it’s not perfect. There really is a lot of slop around some of the smaller lines, one of his eyes has bled onto his cheek (in mine, at least), and there are a few other little messed-up details. But those are gnats, not camels (do you get the reference? ), and this figure is so impressive as a massive whole that those little missteps are easy to overlook. 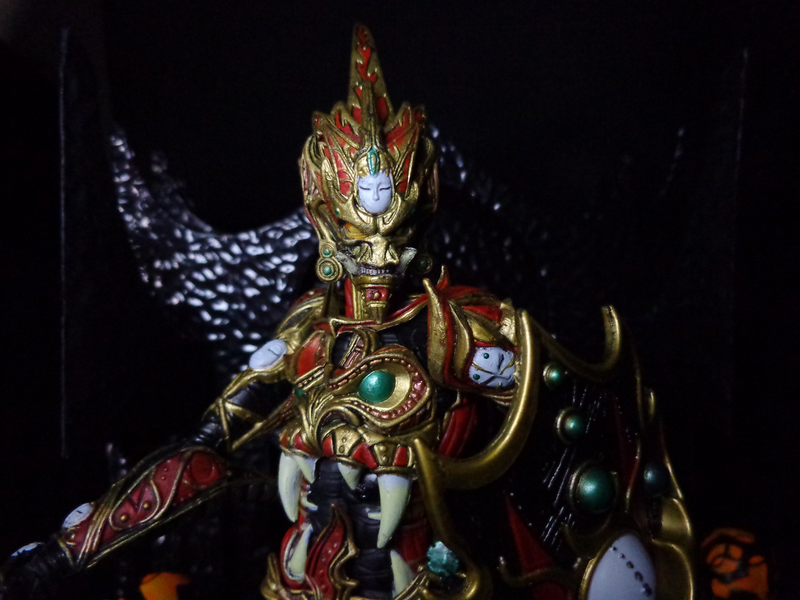 Mandarin Spawn changed the face of toy collecting… but not only in a good way. He was really the first of McFarlane’s pseudo-statues, where articulation was not only limited, but kind of useless. Mandarin Spawn has a swivel neck, shoulders, and left elbow, hinged right elbow, swivel right wrist, and swivel hips. The legs might as well be immobile – they barely move as it is, but those swivels are good for making sure that Mandarin stands securely. 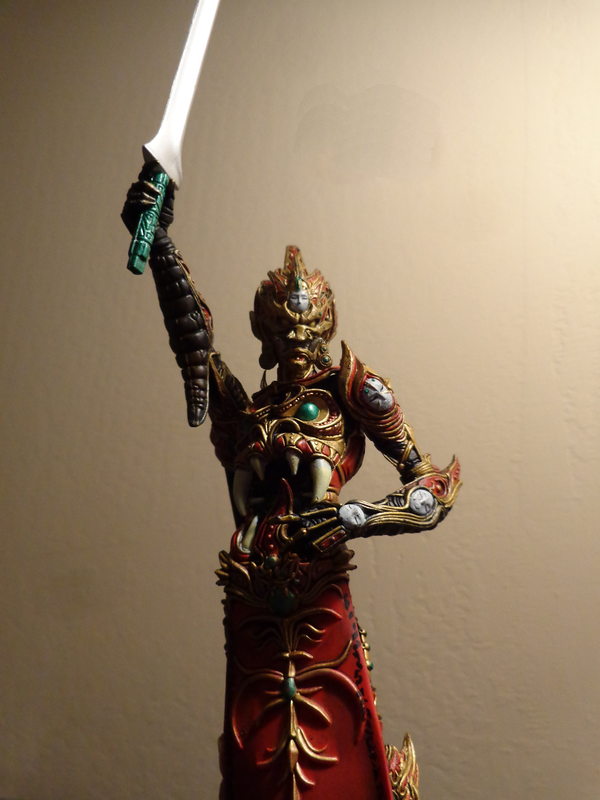 The head is serviceable, but the arms really only exist for a couple of decent (yet awkward) poses around his weapons. Mandarin Spawn cannot fight. Mandarin Spawn II could (though he was also heavily pre-posed), but the original can’t do anything besides stand there. Trust me, I’ve tried. The poses in these pictures are pretty much all he can do. At first glance, Mandarin Spawn’s accessories seem awesome, and in a way they are, but they’ve got issues. His best piece is his massive shield, which just looks as fantastic as his body! It clamps securely to his left arm, but is made of stiff plastic, so it might scrape the paint. 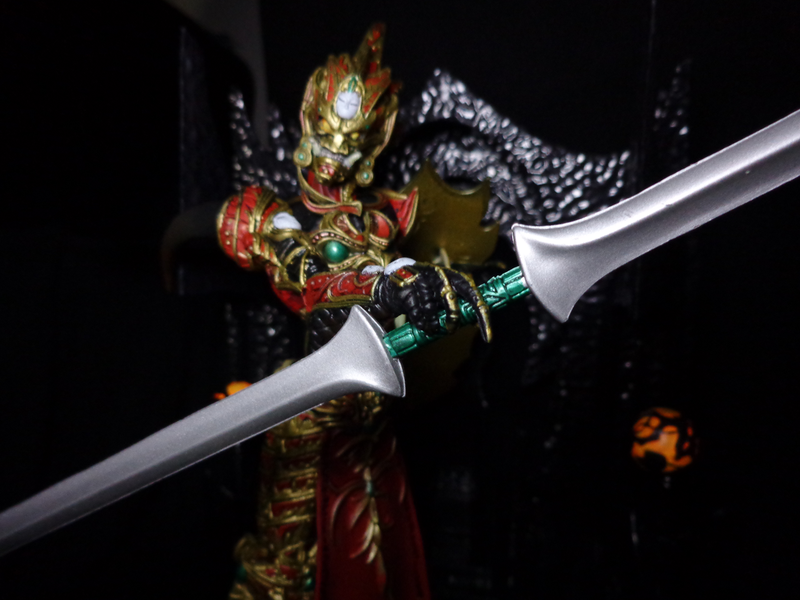 Mandarin Spawn also comes with a tremendous sword – he’s about 9″ tall, and the sword is easily a full foot when assembled. It comes in two halves like something Darth Maul would use, but can be split up to let Mandarin hold an ordinary abnormally-gigantic blade. It’s cool, but his articulation makes it pretty awkward to pose or hold. 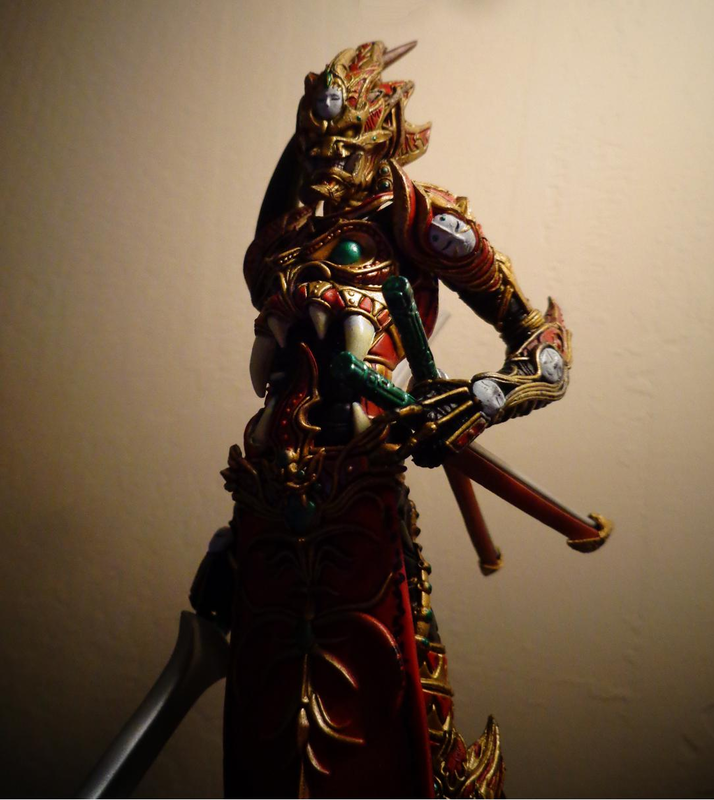 Mandarin Spawn also has a set of Japanese swords – katana and washizaki. Both swords are just a little too small for him, but he also can’t hold either one well. They are meant to slip into a pair of scabbards that plug into Mandarin Spawn’s hip… and those are the worst aspect of the figure. They are stiff and brittle, stick straight out, and are guaranteed to snap and crumble. You can’t lean him on his back if they’re in! 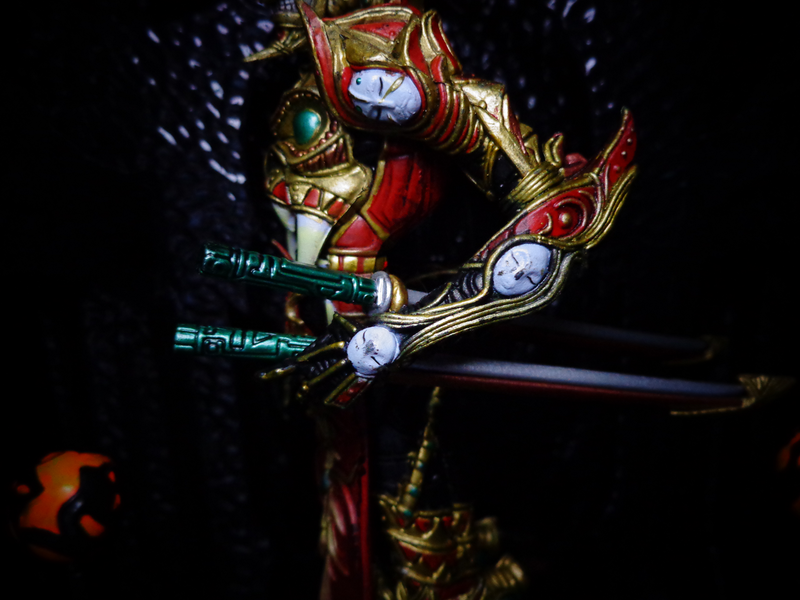 They are also open the top, so his swords have a tendency to tilt and then slide out. Seriously, 99% of my complaints about this figure stem from this one accessory. This… depends. He was originally a $10 figure, which is insane by today’s standards. Sometimes you can find him even now for $15-$25, which are also good prices. But you also might see him at $40-$50, and that is bad. I paid $10 at a toy con. Lots of things. Lots and lots of things. This just isn’t a toy that’s meant to be played with, ya know? 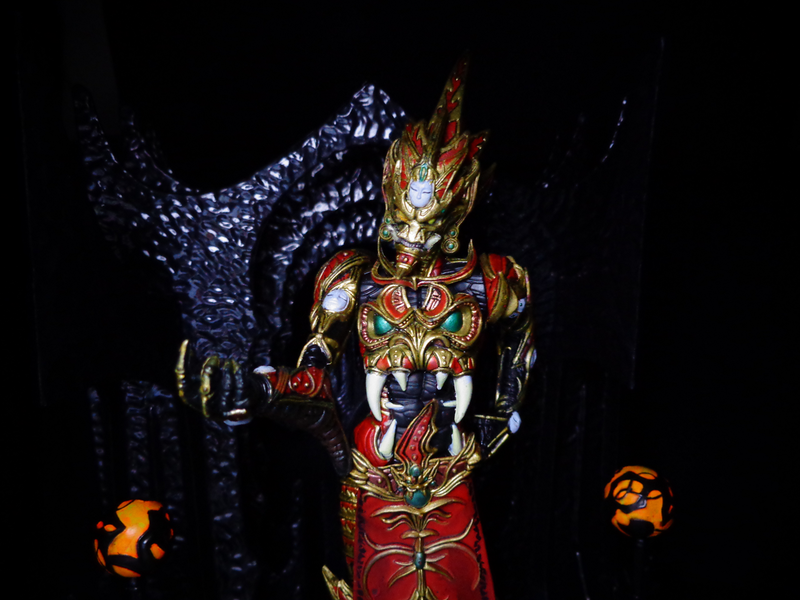 but anyway, Mandarin Spawn is kind of brittle, and his accessories are even worse. 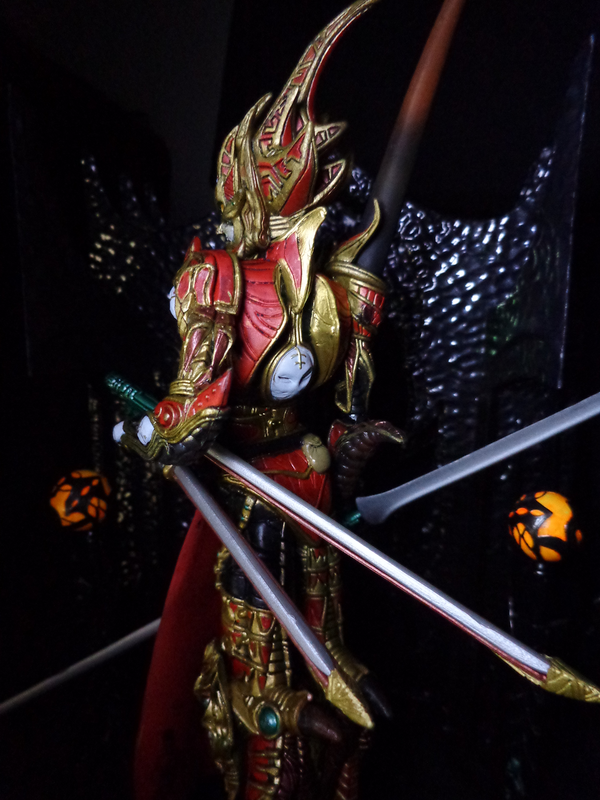 His big sword is kind of fragile, and the two small sword scabbards are terrible! They’re brittle, they stick straight out, and they break very, very easily. His shield is durable, but it’ll probably scrape his arm paint. And Mandarin’s joints, especially in the arm, are likely to get stuck, so be careful when you first work them loose. Sheesh. For a toy this old, you’ve got two choices – eBay, or toy conventions/vintage toy sellers. I’d suggest the latter if you see them anywhere nearby, as they usually have better prices. But eBay shouldn’t sting too badly! Despite issues with his articulation and accessories, Mandarin Spawn is still one of the best-looking figures ever made. It’s not a very good “toy” in that you can’t “play with” him – can’t pose him, and he’s fragile – but he’s an awesome work of art. All the repaints were great, too. 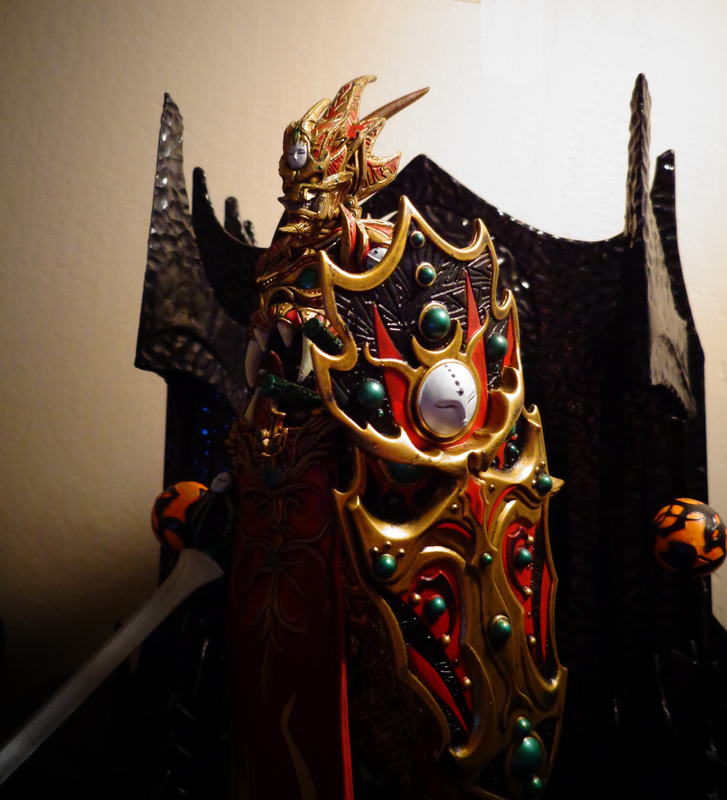 In fact, the redo – Mandarin Spawn II – was also fantastic, and maybe someday I’ll track one down. But… it’s not a toy. That’s gotta be worth something on the final rating. 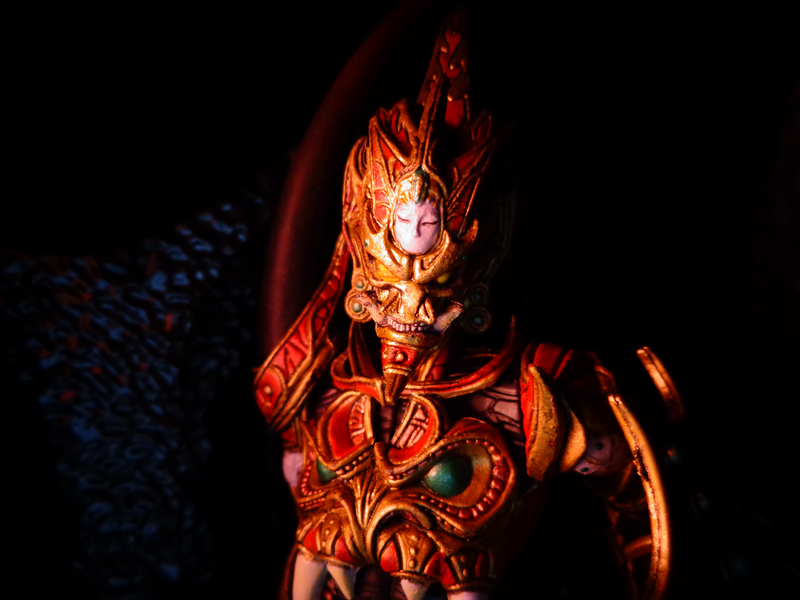 In spite of that, though, enjoy this mysterious warrior from another world… and his really pretty armor. Enjoy that, too. I actually think McFarlane has an oft-unacknowledged role in making 6″-7″ the industry standard scale. Their figures slowly creeped up from about 5″ to 7″ by the time they started making Movie Maniacs. Most of their figures wavered back and forth between those scales (and still do, in their sports figures, for example). When ToyBiz started making their super-articulated, super-detailed Spider-Man Classics, I think they had McFarlane’s influence in mind. There was a lot of detail in those figures and it was a big step up for ToyBiz at the time. Yeah,that really does make sense – especially the creep up to 7″. Though all the same, it was Marvel Legends that absolutely torpedoed other scales, with 4″ and 12″ eventually rebounding. I gotta check out the site more; this was a great piece. It’s discouragingly rare to find well-written toy commentary; maybe that’s why so many people produce video reviews? I do wonder whether it means anything to suggest that an older figure looks good “even by today’s standards” when, for every triumph from Neca or Hot Toys, there’s a dozen depressingly mediocre mass retail toys that are far worse than the standard fare of a decade ago. It means something precisely because of NECA and Hot Toys.